If you’ve been up to the summit of Snowdon and tried to come down the same way, unless you’ve made a mental note of exactly where you were when you staggered those last few metres to the summit it is quite easy to take the wrong route down. Some mistakes cause no more than minor annoyance when you find you’ve gone well out of your way, and either have to retrace your steps to the summit again, or to continue down and find a way to get back to your car. Other mistakes though can be quite costly – the Bwlch y Moch path is not one for inexperienced walkers and is described quite simply as ‘dangerous’. Crib Goch, is a knife edged ridge that is not for the faint hearted, and should not be attempted by the novice or poorly equipped walker – a point that was unfortunately highlighted by a coroner in a recent inquest who attributed inappropriate footwear (in the form of trainers) for the damp weather conditions to be at least partly responsible for the death of a woman last year. To help walkers find and keep on the right path the Snowdonia Park Authority are placing 13 stone pillars to signpost the paths to prevent walkers making navigational errors and getting into difficulty. The pillars will be placed during the next few weeks at the start of the major walks: the Llanberis Path, Rhud-Ddu Path (Beddgelert Path), Snowdon Ranger Path, Miners Track and the Pyg Track. Later there will be additional pillars marking, for example, where the Llanberis and Snowdon Ranger paths meet, and one to identify the Bwlch y Saethau Path, and the start of the Watkin Path where it descends from the summit. The decision to place the pillars, which have all been made from recycled stone from local disused buildings, was taken as although only a small number overall of the 366,000 walkers who ascended Snowdon last year got into difficulties, those that did, did so at more or less the same points. There were 176 call outs to the Mountain Rescue Team during 2012. 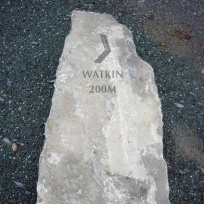 The stones will hopefully encourage walkers to follow the correct footpaths and to reduce the number of call outs to Mountain Rescue.